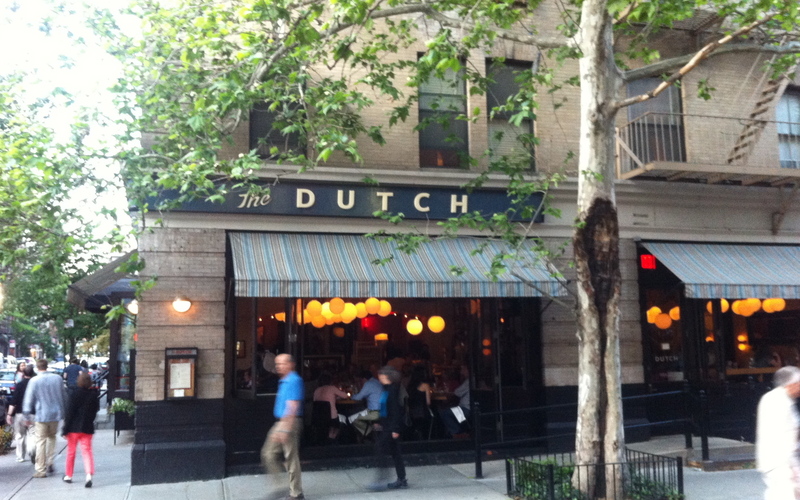 Of all the noisy restaurants in this abominably loud city to Andrew Carmellini’s The Dutch must go the dubious distinction of sporting the most inexplicably ear-splitting acoustics. While the decor is a pleasingly comfortable homespun ode to American earnestness, the decibel level makes it a little like dining on the verge of the BQE or trying to eat in the mosh pit of a rock concert: you live in fear of being bumped from all sides because honestly, there’s no way a group of ordinary humans could be THIS LOUD. I want to make the font larger, the bold bolder, the caps more capital to emphasize just how loud the hive is because even for a Saturday night in Soho it is VERY, VERY LOUD! And that takes away from the food, I fear, which is pretty darn delicious from soup to nuts. As twilight gently envelope a momentarily quiet corner window table we start with Jersey asparagus because – smelly pee be damned – ’tis the season for asparagus. 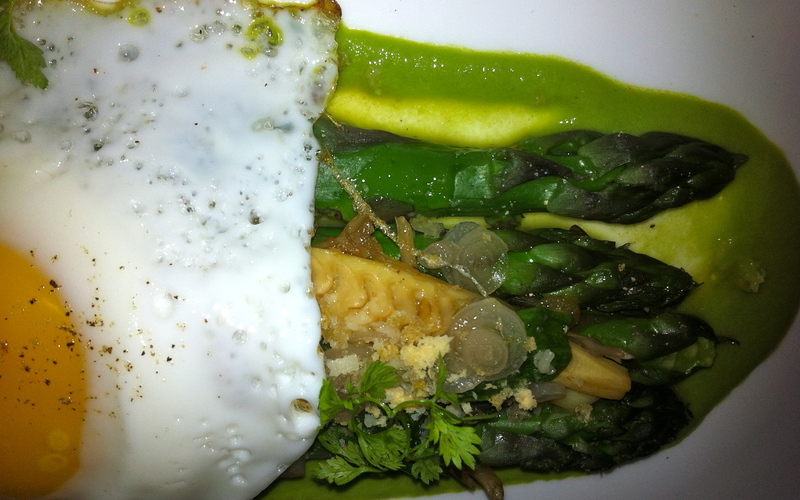 (In food fetish circles mid-May generally marks the time ramps relinquish their crown to the noble asparagi) Fragrant, toothsome, adorned with the slightest hint of tarragon and the buttery yolk of a fried – versus poached – egg, it’s like eating stalks of spring: verdant, earthy, and above all, vital. Steak tartare is equally alive, the beef tasting of its grassy diet and topped with white anchovy and a piquant dollop of caesar salad. A dozen New England oysters follow: meaty Massachusetts Peter’s Point and Rhody Matunucks thick with brine. Maybe it was the first round of cocktails – for me, The Last Oaxacan, a smoky mix of yellow Chartreuse and pineapple infused Mezcal; an aromatic blend of Thai basil, kaffir lime and vodka for my partner in crime, the Cassia Blossom – or the first bottle of Trimbach, but it’s at this point I notice we are speaking quite loudly while leaning in across the table to listen to each other. When main courses arrive we pay significantly more attention to our plates because it’s a losing battle trying converse at a sufficient volume while not shooting torpedos of food at the person across from you. It’s a taste-a-palooza, however, so we’re both happy to shut up and dig in. 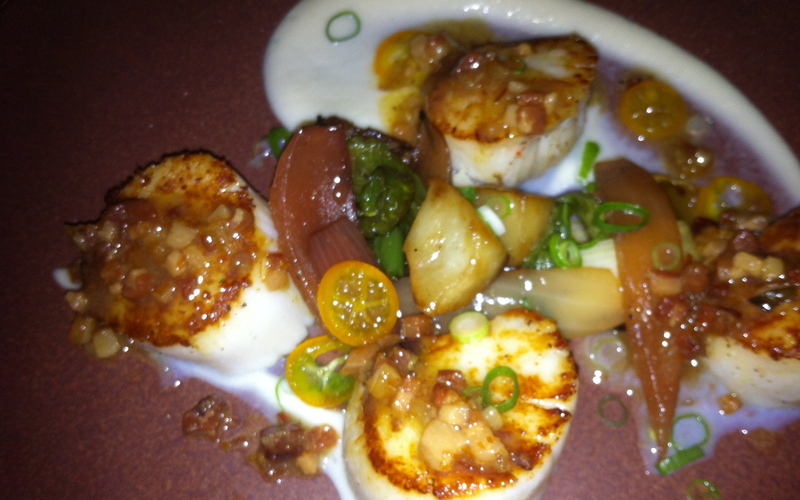 I’ve got five plump sea scallops glazed with bacon jam, jalapeno and kumquat. It’s a smoky-spicy-citrus trifecta that makes me want to shout “Yahtzee!” Across the table, my friend has a bowl of tarragon-roasted chicken with morels and charred leeks. The earthy smells perfume the table like narcotics and we happily pass plates back and forth in silence, like a joint shared at the beach – as oblivious to the noise as the crash of the surf. It’s a happy spell of satiety that’s cast, made even better by dessert – an ethereal banana cream pie that makes me yearn for summer. In fact everything this evening, save the noise, has been so seasonally focused that it has me looking forward to what might follow: summer corn, blueberries, and sea bass; autumn lamb, apples, and winter game. Chef Carmellini, you can cook for me anytime. But could you find a way to keep it down just a bit?